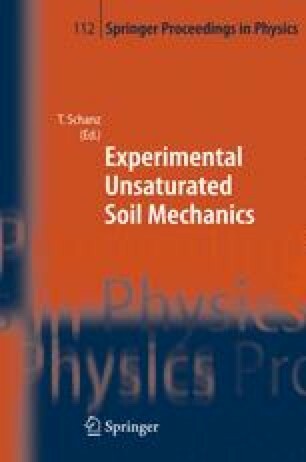 In the following paper an influence of several state parameters on one dimensional time-dependent material behaviour of an unsaturated soil is presented. For identification of parameter values, laboratory experiments were performed. Standard oedometric compression tests were carried out to investigate stress-strain-time relationships. Apart from the degree of saturation the initial void ratio vary as parameters. For measuring the matrix suction a tensiometer is mounted inside the specimen. A detailed description of the equipment used and the test procedures are given in the paper. The tests reported here were carried out with a kaolinite to determine parameter values, depending on different state variables. The characteristic behaviour of unsaturated samples observed during consolidation and creeping is shown in a series of figures. Parameters like Cc, Cs and Cα are used in constitutive model that can simulate both consolidation processes as well as creep phenomenon for partially saturated clay in a single consistent analysis.